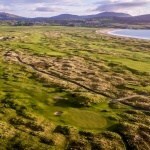 Castlerock Golf Club is a classic links course set amidst towering dunes. It is situated in the seaside resort of Castlerock, which lies approx 5 miles west of the town of Coleraine on the North Coast of Ireland. Only a 20 minute drive from both Portstewart Golf Club and Royal Portrush Golf Club, Castlerock Golf Club is a more than worthy neighbour to both of these great Irish links. Founded in April 1901, the original course comprised of 9 holes and was laid out on the western part of the present course. Additional land was leased in 1908 and Ben Sayers, the professional from North Berwick in Scotland, was commissioned to design an 18 hole layout. Though better known as a club maker, Sayers produced a superb layout and insisted that the links of Castlerock would equal those at Troon, North Berwick and Sandwich. Though not officially recorded, it is known that Harry Colt, while spending much time in Ireland with his work at Royal Portrush, was consulted regarding the redesign of the Castlerock links around 1930. Today, Castlerock Golf Club is rated as one of Ireland’s finest links courses and it’s status in the game is reflected by the fact that is has hosted many National Championships both Amateur and Professional. 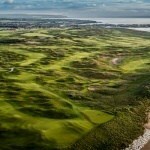 Castlerock Golf Club currently has 27 holes, which includes the 18 hole Mussenden course and the 9 hole Bann course which has been opened in recent years. The Mussenden course has finished its first phase of renovations in 2018 and the second phase will begun in late 2019. 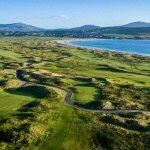 If you would like to play Castlerock Golf Club as part of your customized Ireland Golf Package, please contact us on Ph: +353 (0)91 868642 or Email: sales@northandwestcoastlinks.com . Check out some of our sample packages here.